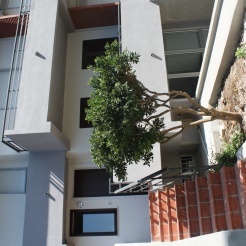 It is a terraced house within a residential area with a beautiful view of the sea of Bonagia and Mount Hood. A few kilometers from Monte Erice, San Vito Lo Capo Trapani. The structure consists of two apartments. The one used for holiday house consisting of a large eat-in kitchen, a shower room is spacious bedroom. Two balconies allow guests to enjoy the beautiful panoramic view of the sea and Mount Hood and Erice, the other gives access to a large garden. You can enjoy private indoor parking. The apartment is equipped with TV. The request and to 20-22-25€ a day per person respectively if it is low-medium-high season..
For stays longer than 5 days in any period of the year to inclusive price will receive a discount of 10%.